A 21 Years Old blended malt Whisky fit for the Queen. In 1953, Chivas Brothers paid tribute to Her Majesty Queen Elizabeth II by setting out to create the ultimate blended Scotch whisky. The first flagons adorned with the royal crest, were sealed on the day of her coronation. It was to be known as Royal Salute 21 Years Old, after the 21-gun salute of friendship and respect that has been fired to honour dignitaries, sovereigns and nations since medieval times. Royal Salute is bottled in hand crafted porcelain flagons, produced by Wade porcelain, bearing a Gaelic motto which translates as 'fidelity, stability since 1801'. The three different colours of glaze on the decanters - ruby, sapphire and emerald - symbolize the precious gems on the Imperial State Crown. Every single drop of whisky within this blend has matured for a minimum of 21 years. 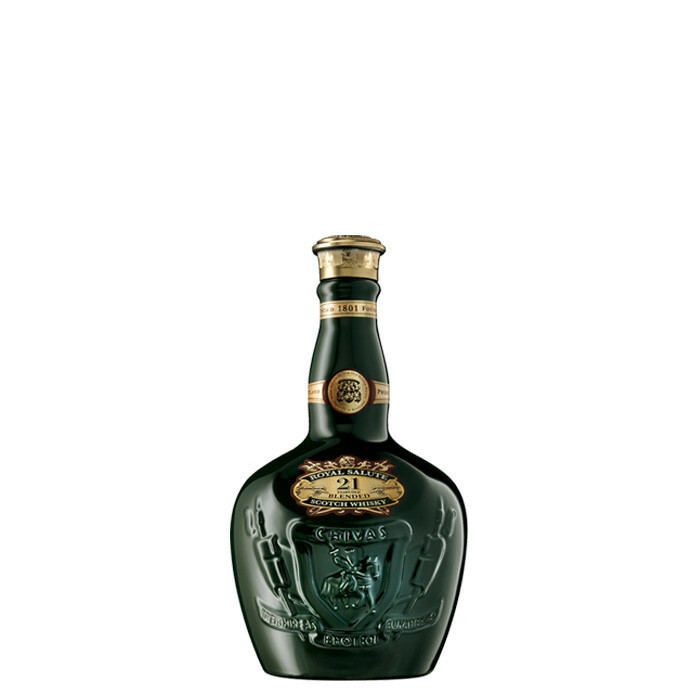 The Emerald decanter was first introduced in 1985 to the Royal Salute collection. Nose: Soft, approachable, ripe fruit, and old oak with a dash of ginger and honey. Rich, fruity aromas and the sweet fragrance of autumn flowers. Palate: Soft with sweet malt, a gentle grainy oak, and a distant smoked honey. Notes of full, deep fruity flavours on the palate with subtle hints of smokiness. Finish: Rich, long and lingering on the finish. Delicate and smooth.